Ideal for beginners, the Tunturi T20 treadmill is designed with only the most basic and important features of an exercising machine. But when used regularly, you can still achieve your fitness goal – whether it’s losing weight or improving your cardiovascular endurance. Also, since it belongs to the Tunturi line of treadmills, you can be sure that is one of the prettiest looking treadmill in its price range. However, it would seem a bit overpriced for the features it carry. 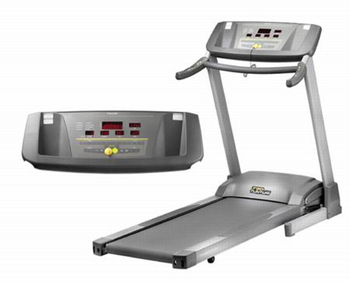 The Tunturi T20 treadmill is ideal for light runners. Its 2.5 HP motor may not be able to withstand rigorous training sessions. So if you will use the machine for leisure exercises only, then this should be a good choice. The 2.5 HP continuous duty motor of the Tunturi T20 treadmill provides a powerful and smooth operation for your light runs. Maximize your intensity by adjusting your speed to up to 10 mph or your incline to up to 12% and you will notice that the motor remains quiet and unobtrusive. The running deck of the machine provides enough area for a convenient and comfortable run. Measuring 19" x 56", you should have enough room for walking or light jogging, if you have a normal built body size. This running surface is ideal for beginners, those who are still getting the feel of the machine and just starting to run. In addition to this, the deck of the machine is also foldable, hence good for transport and storage. If you have a limited space at home, this feature will help you save space when the machine is not in use. Like any Tunturi treadmill, the console offers numerous details about your exercise. In fact, it features multiple displays that let you know your important statistics including time, distance, speed, incline, heart rate and calories burned. Plus, there are 10 pre-programmed workouts that you can choose from, including training modes and heart rate control modes. Too focused on your run? Adjust the speed and incline of your machine through the quick keys located at the hand grips. Just one press of the button and you shall keep your workout concentration. The hand grips, on the other hand, are built with contact sensors that measure your heart rate. This feature allows you to accurately monitor your heart rate and know whether you’re doing the right workout or not. According to several customer reviews, there have been numerous complains about the faulty motor board of the machine. They say that owners should expect this problem to show up after 18-24 months of use. Also, with its price tag of nearly $1,800, it doesn't offer a lot of value for your money. You can get more by buying from another brand. If you plan on buying a Tunturi T20 treadmill, I suggest you buy it from Amazon.com. You can get it for just $1,799.